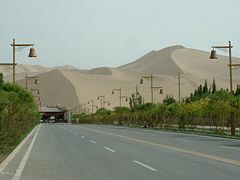 Echoing-Sand Mountain (Mingsha Shan) is essentially part of the same area as the Crescent (Moon) Lake, near Dunhuang and Turpan. Crescent (Moon) Lake is apparently an oasis surrounded by the highly sandy area composed of high dunes. The Mingsha Shan is so named for the sound of the wind whipping off the dunes. The area is very popular with tourists, the great majority of them Chinese. A street lined with souvenir stalls leads up to the entrance to the complex. Most tourists ride camels, organized by the complex operators, to reach the sand dunes. Typically the camels are guided by a local camel guide, who include both women and men. At the dunes, a popular activity for tourists is to ride sleds down the sand slopes, much like snow-sledding during winter in temperate zones. Along the side of the Crescent (Moon) Lake is a pagoda in traditional Han Chinese architecture. This page was retrieved and condensed from (http://en.wikipedia.org/wiki/Dunhuang) see Wikipedia, the free encyclopedia, November 2007. Hui Chin and I joined a conducted bus tour from Urumchi to visit Turpan. It was a very interesting trip and full of drama, as there was many interesting places to visit and there was also a number of arguments on the bus about the tickets and sights to be visited, the sitting arrangements on the bus and also about the food and the quality and hygene standard of the restaurants we have visited. To cap it all of, my camera's battery ran flat, half way through, our spare battery and another camera sitting safely back at the hotel in Urumchi (laughing at our misfortune), but a few weeks later I had even worst news, when, after returning home, I found out that two of my new 2Gigabyte SD memory cards, although seemed to work perfectly at the time, have invisible pictures on them. The pictures seem to exist alright, with all around the 200 plus kilobyte properties and showing as jpeg pictures, but can't be viewed. I have lost some very interesting, unusual and irreplacable pictures of Turpan, Urumchi, Bishkek in Kyrgizstan and pictures of the countrysides of Kyrgizstan and Kazakstan. Now altough we were there and had our visual and phisical experiences, I have to take advantage of using Wikipedia, the free encyclopedia's resources with our greatful thanks. Author. I would like to mention a few things, that was mentioned to us during our visit to Turpan, but I do not find any mention on the pages and articles I read before putting this page together. Turpan is sited in a basin (Turfan Depression), at the second deepest hole after the Dead Sea - under sea level. (328ft. below sea level). Turpan is one of the hottest place on earth, due to its desert location and relative altitude. Turpan also one of the driest place on earth again due to it's location and altitude. (This last two points make it ideal place to grow grapes and other fruit with the Karez (water) System's help. Some of Turpan's listed attractions may be 40+ kilometres away, normally they still will be listed as Turpan's attraction. On the way to Turpan from Urumchi our bus stopped at a fortress, as I lost the many photos I have taken of this place - as I have explained above, now I can't find any reference or mention of the place - can somebody help me, please? Author.